Extending out an assessment for your students can be useful if unexpected events come up during the assessment or your students need more time than was originally allowed. If the assessment has begun and a student hasn't yet made an attempt, you will not be able to extend the time limit this way. Instead, you can reopen their last attempt. If every student has already started working on the assessment and it has since closed, you'll need to create a copy of the assessment and have them start again. 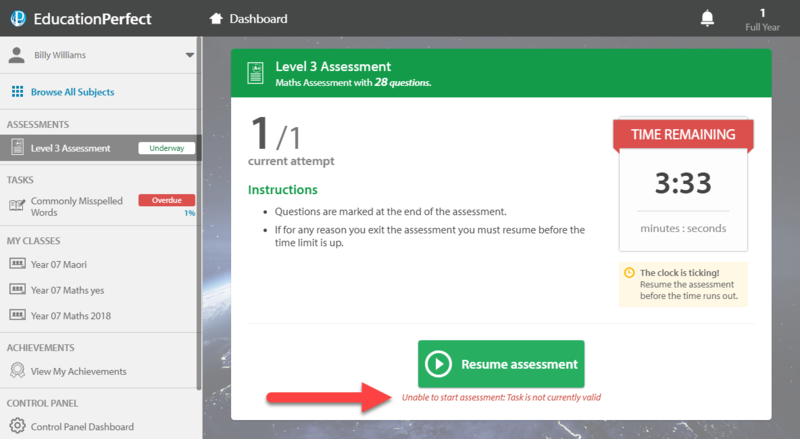 If you would like to extend out the time limit for all students taking the assessment, you can do so through the green Assessments tab of your Control Panel. Click on the Details section of the desired assessment. Scroll down to the Assessment Conditions section, select Change Conditions and input how much extra time you would like to give your students. Click Save Changes when you are happy with the new time limit. If your students have already started the assessment, you can extend the time limit through the Monitor section of the desired assessment. Choose how much additional time you would like to allow students to have on the assessment. When you are happy with your changes, click Extend Time. The additional time that you allow will only be granted to students who have an active attempt. If a student begins their first attempt after you have extended the time limit, they won't be given any additional time. If you would like to extend the time limit for an individual student, you can do so through the Monitor section of the assessment. First you will need to select the student in the sidebar. After that, select Extend time limit. You will then be prompted to choose how many more extra minutes you would like to allow for your student. Once you are satisfied, click Extend Time to confirm. If the student has already submitted their attempt, you will still be able to extend the time limit for them. All you need to do is select their name in the sidebar and then Reopen last attempt. You will then be prompted to choose how many more extra minutes you would like to allow for your student. Once you are satisfied, you can click Reopen Attempt to confirm. Please note that once you click Reopen Attempt the extra time will start counting down. Please make sure that your student is ready to start working when you do this. If you extend the time limit of your assessment after the due date has passed, your students will still not be able to access the assessment. Instead they will receive the error message "Unable to start assessment: Task is not currently valid." In order for your students to be able to access their assessment, it will also need to be reopened. You can do so by following the instructions in our article here.